as well as all spaces in the square to the bottom left of the space. Spaces with goods symbols are considered covered already. In the early game, you can cover 3 numbers with a single tile (here: using a robe). (Unfortunately, if you do, you will also cover the mead space, losing a potential mead bonus). The placement areas depict growing squares in order to remind you of these placement rules. Green tiles cannot be orthogonally adjacent to other green tiles (diagonal adjacency is allowed). (An illustration on your home board reminds you of that). 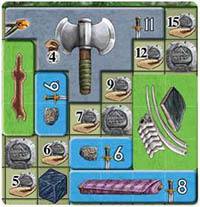 Blue tiles can be adjacent to other blue tiles, as can silver coins to other silver coins, and ore tokens to other ore tokens. Occasionally, players will ignore this rule unintentionally. If you notice the mistake too late, see page 23 for a way to handle that. When you place a goods, you cannot place it on top of another goods that is already there (not even partially). You can, however, cover spaces with goods symbols. Keep in mind, goods spaces are considered covered already. Each goods you place must be placed within the bounds of the placement area. The home board has three additional spaces at the top right, so that you can place bigger tiles like the treasure chest during the end game. To avoid negative points, you are explicitly allowed to place goods wherever you like in the placement area, as long as you do not cover income spaces that you are not allowed to cover. The special tiles are considered to be blue and follows the same rules as the blue good tiles. Here is an example of how to cover the spaces in the top right corner without covering the income spaces that you are not allowed to cover. 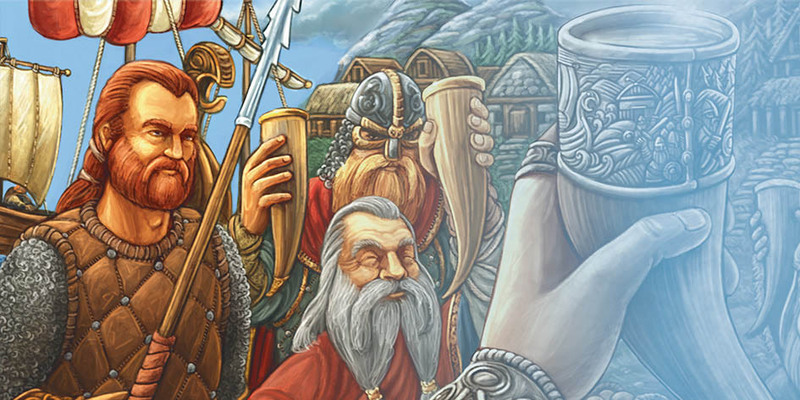 As with the home board: at any time, you may place green craft products and blue luxury goods as well as silver coins and ore tokens on empty spaces of the exploration boards, according to the same rules. 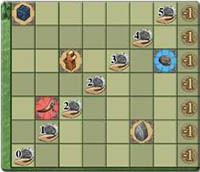 Note that there might be spaces in the center of an exploration board that you are not allowed to cover with goods, like the "5" on Bear Island. These spaces have a very prominent green border. A lot of goods spaces on the exploration boards are surrounded by less than 8 other spaces, which makes it easier to enclose them for the bonus. To unlock the rune stone and ore bonus on Bear Island, you only need to cover six spaces. At any time, you may place orange farm goods, red animal products, green craft products, and blue luxury goods as well as silver coins on empty spaces of your houses. Orange tiles cannot be orthogonally adjacent to other orange tiles, and red tiles cannot be orthogonally adjacent to other red tiles (diagonal adjacency is allowed, as shown in the illustration on the house tiles). Once you place a goods tile on a board or house, you cannot take it back. You may, of course, test tile placements in order to plan ahead, as long as you take them back before continuing. During phases 7 and 10, all income and bonuses are generated at the same time; consequently, you may not use the income/ bonuses from one board to place game pieces on another board in the same phase. Note that you cannot cover the pillar spaces in the long house. Although you cannot take back tiles once you placed them, we still recommend you place as many as you can before the income and bonus phases. Especially the large tiles as they belong on the boards and not in your supply. At any time, you may buy a ship by paying its cost in silver. The cost of a ship is equal to its value (also depicted on the supply board for ships). Instead of buying ships, you may build them with wood by using a "Ship Building" action space. The whaling boats are small boats. Knarrs and longships are considered "large ships". The knarr costs 5 silver. Each whaling boat costs 3 silver, each knarr 5 silver, and each longship 8 silver. Each ship you acquire must be placed in your bay, on a landing stage of appropriate size (you cannot place whaling boats on the larger spaces). At any time, you may make change with your silver coins. Silver comes in denominations of 1 silver, 2 silver, 4 silver, and 10 silver. The silver coins are designed such that you can place them in the placement areas and houses. At any time (including immediately before, but not during an action), you may place ore from your supply on the designated spaces of your whaling boats and longships. You may not take back the ore you place on your ships. Longship are used for raiding and pillaging. Whaling boats are used for whaling. They show 1 preprinted ore and provide space for 1 more ore. Many occupations provide actions you can take at any time. The blue background color indicates an anytime action on an occupation card. You cannot simply give away or discard goods, ships, boards, or cards outside of an action.